In this Nov. 9, 2017 file photo, President Donald Trump and Chinese President Xi Jinping shake hands during a joint statement in Beijing. Since then, Trump has imposed tariffs of up to 25 percent on China-made goods, in an attempt to protect U.S. industry and pressure China to open its markets more. On Oct. 19 Trump pulled the U.S. out of a longstanding international postal agreement that had forced the U.S. to subsidize China shippers of items under 2 kilograms (4.4 pounds), who compete with U.S.-based retailers, importers and manufacturers. 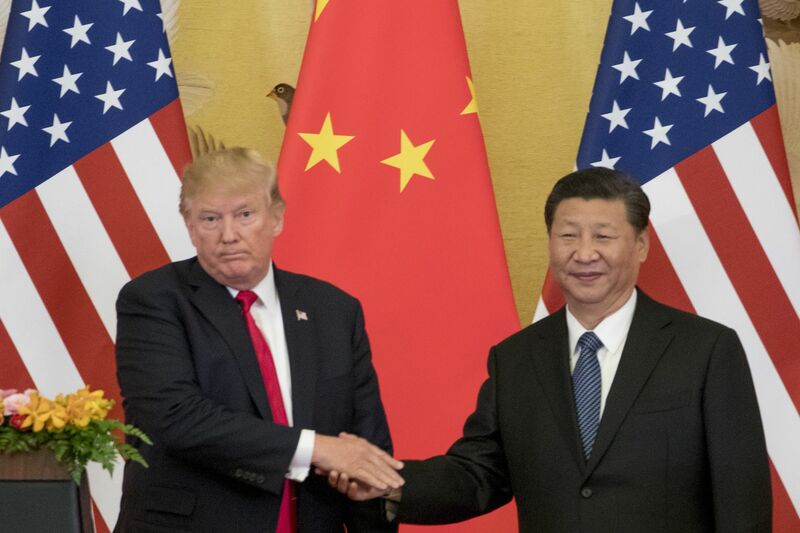 U.S. manufacturers, mass-market importers, and retailers cheered President Trump's hardball decision to pull out of an 1874 treaty and boost postal rates on small packages from China and other countries. Trump said in a statement Wednesday that the U.S. is withdrawing from the Universal Postal Union, a multinational group the U.S. cofounded to standardize and reduce global postal rates. U.S. companies complained that the agreement penalizes makers and sellers in developed countries such as the U.S., and gives unfair advantage to merchants in low-wage countries such as China, who use postage subsidized by importing countries such as the U.S. to increase one-item sales through internet markets. The rates have been structured in such a way that Amazon and other shippers often charge more to ship goods between U.S. locations than it costs to order them from China. The president made his move after the National Association of Manufacturers called last spring for a "modernized and far more fair arrangement." Sometimes the subsidies appear extreme: last week, Bloomberg reported that eBay was offering a 76 cent yoga-pants special from China-based shipper Webstainless to U.S. buyers, with shipping mostly paid for by the U.S. Postal Service's ePacket program. The Postal Service said U.S. subsidies of Chinese imports under the treaty cost the U.S. $170 million last year, and the expense has been growing. Secretary of State Mike Pompeo's office has said world postal officials were moving too slowly in responding to U.S. demands for renegotiating the treaty to be "fair and nondiscriminatory" and to "avoid a preference" for foreign shippers over local ones. Even importers who sell lower-cost China-made products praised the change. Ending the postal subsidy for foreign mail delivery "is very important for U.S. retailers and is a step in the right direction," said Patrick Cunnane, head of Philadelphia-based bicycle importer and retailer Advanced Sports Inc. and the Performance Bicycle chain of bike stores. What's good for manufacturers, importers, and retailers will translate to fewer discounts and less choice for Web-shopping U.S. consumers, who will find it more difficult to locate low-priced foreign bargains online without paying the full cost of shipping items from Asia. "Chinese sellers on eBay and other platforms may disappear, or at the very least they will not find it so easy to sell to Americans anymore," Gary Huang, chairman of the supply-chain section of the American Chamber of Commerce in Shanghai, told a Bloomberg reporter. "This has been a big advantage for them for many years and how they've beat out the American seller on their own turf." While China companies use the U.S. Postal Service's ePacket free item shipping service, private shippers including FedEx Corp., United Parcel Service Inc. and DHL Worldwide Express charge about $50, making those services, and the U.S. retailers who rely on them, uncompetitive compared with free and low-cost postal rates under the Universal Postal Union rules, Bloomberg reported.